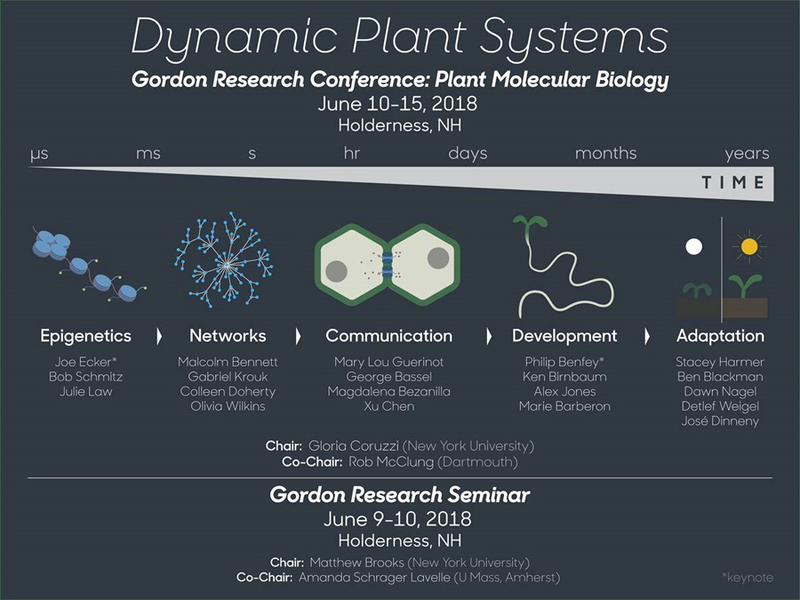 The theme of the 2018 Plant Molecular Biology GRC is "Dynamic Plant Systems". At this meeting, we aim to foster interactions in this emerging new field - plant system dynamics. Our goal is to spark discussions and collaborations across different scales of time (minutes, hours, days, years) - and across different levels of inquiry - from epigenetic and transcription dynamics, to dynamics of cell biological and developmental processes, to whole plant physiology and evolutionary dynamics. Our program will bring together thought-leaders in this new and emerging field of plant system dynamics that span PIs, post-docs and students. This GRC will be held in conjunction with the "Plant Molecular Biology (GRS)" Gordon Research Seminar (GRS). Those interested in attending both meetings must submit an application for the GRS in addition to an application for the GRC. Refer to the associated GRS program page for more information. "(Epi)genome Dynamics and the Regulatory DNA Landscape"
"Modeling Gene Regulatory Networks: The Dynamic / Interface Between Environmental Perception and Response"
"Dynamic Evolution of Gene Regulatory Elements in Plant Genomes"
"Adaptation to Environmental Stress by a Dynamic Chromatin-Based Stress Memory"
"Guarding Cellular Identity: Histone Modification Profiling During In Vivo Cellular Reprogramming"
"New Capabilities in Plant Functional Genomics at the Joint Genome Institute"
"Dynamic Regulation of DNA Methylation Patterns by the RNA-Directed DNA Methylation Pathway"
"Evidence for a Unique DNA-Dependent RNA Polymerase in Cereal Crops"
"Dynamics of Underground Signaling Networks"
"Gene Regulatory Network Dynamics: Lessons from Plants"
"Recovering from Stress: A Matter of Space and Time"
"A Mobile Signaling via Small Peptide in Response to Dehydration Stress"
"Regulatory Network Behind Systemic Nitrogen Signaling, in Arabidopsis"
"Dynamic Protein Acetylation Mediates the Biotic Stress Response in Maize and Arabidopsis"
"Network Walking: Genome-Wide Validation of a TF-Target Network that Mediates Early-to-Late Nitrogen Responses"
"Live Imaging of mRNA Synthesis in Arabidopsis"
"Nutrient Dynamics: From Soil to Seed"
"Dynamics of Endodermal Barriers for Plant Nutrition"
"Peptide Signaling During Arbuscular Mycorrhiza Symbiosis"
"Topological Analysis of Multicellular Dynamics in Plants"
"Regulation of Cytoskeletal Dynamics Impacts Cell Shape and Plant Development"
"Dynamic Auxin Signaling from Plasma Membrane to Nucleus Guides Differential Growth"
"MT-Involved Vacuolar Degradation of the Cortical Polarity Complex in the Stomatal Lineage"
"Uncovering Plant-Microbe Relations by Mapping the Spatial and Temporal Dynamics of Effectors in Phytopathogenesis"
"Circadian Rhythms Are Turning Heads: Clock Regulation of Growth Pathways in Sunflower"
"Network-Based Pattern Classification Associates Temporal Dynamics of the Transcriptome with Circadian Regulation of Plant Fitness"
"Integrating Time and Temperature: How Plants Dynamically Modulate Stress Responses Throughout the Day and Season"
"This Is the Rhythm of the Night (and Day)"
"Dynamics of Regenerating the Root Stem Cell Niche: Insights from Single Cell Seq"
"Gene Regulatory Networks Controlling Stem Cell Regulation in the Arabidopsis thaliana Root"
"Unravelling Transcription Factor Functions Through Integrative Inference of Transcriptional Networks in Plants"
"Spatiotemporal Regulation of Hormone Patterns Influencing Plant Development"
"Cross-Species Functional Diversity Within the PIN Auxin Efflux Protein Family"
"Plasticity in Photosynthesis Across Time-Scales"
"Genetics and Epigenetics of Environmental Adaptation in Real Time"
"Sunflower Domestication in Space and Time"
"Contrasting Maps of Genetic Constraint Between Domesticated and Undomesticated Species Reveals the Regulatory Changes Associated with Transition to a Food Crop"